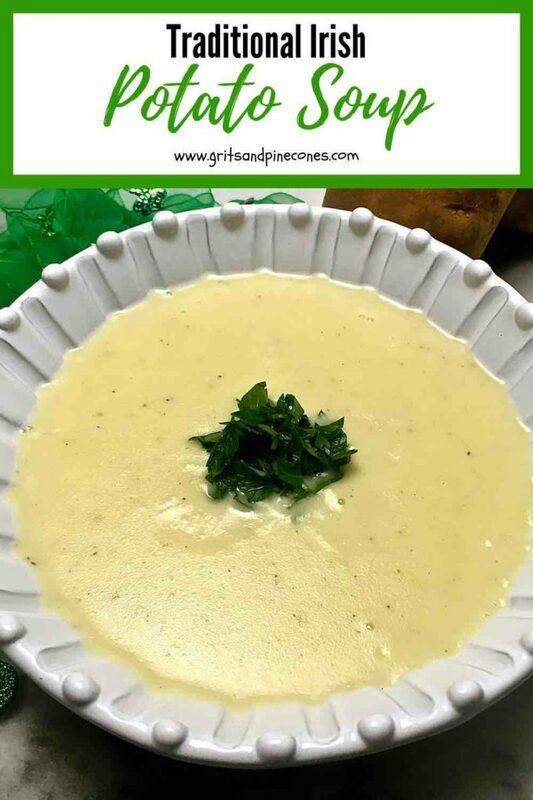 The best and easiest Traditional Irish Potato Soup is as simple to make as it is delicious and nutritious! 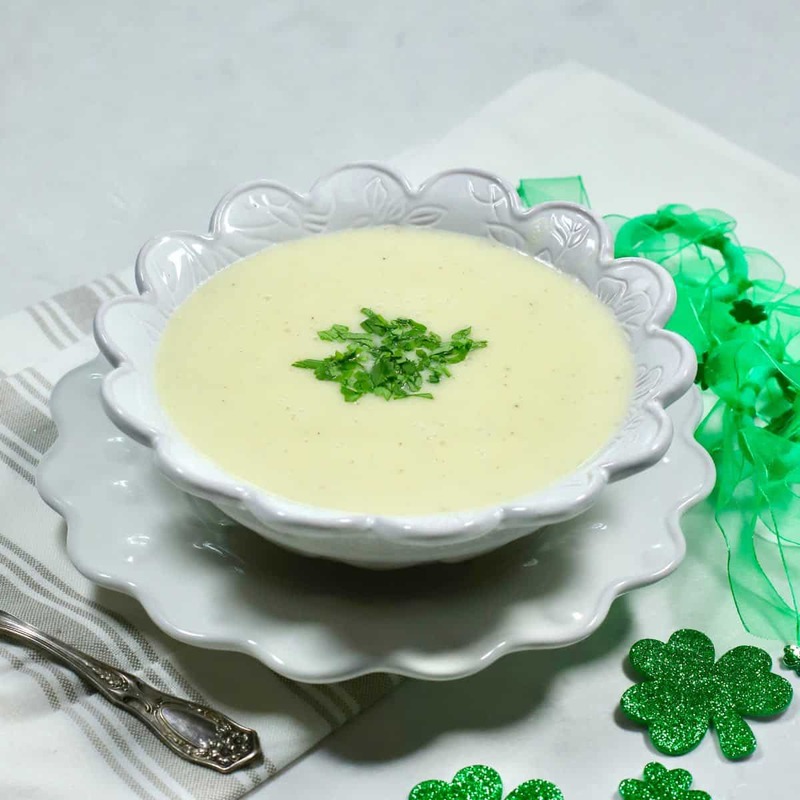 This creamy soup is perfect for a St. Patrick’s Day meal or any meal for that matter. Even though potatoes are synonymous with Ireland, potatoes didn’t originate there. They made their way to Europe in the 1500s after Spanish conquistadors discovered them in the Andes Mountains. But potatoes, which are the world’s fourth-largest food crop, were an important staple for Irish working-class families and still are today. Potatoes are an excellent source of vitamin C, a good source of potassium and vitamin B6, fat, sodium, and are cholesterol free. Best of all, they are only 110 calories per serving. But when combined with celery, onions, and milk, Traditional Irish Potato Soup reigns supreme and is a powerhouse meal. 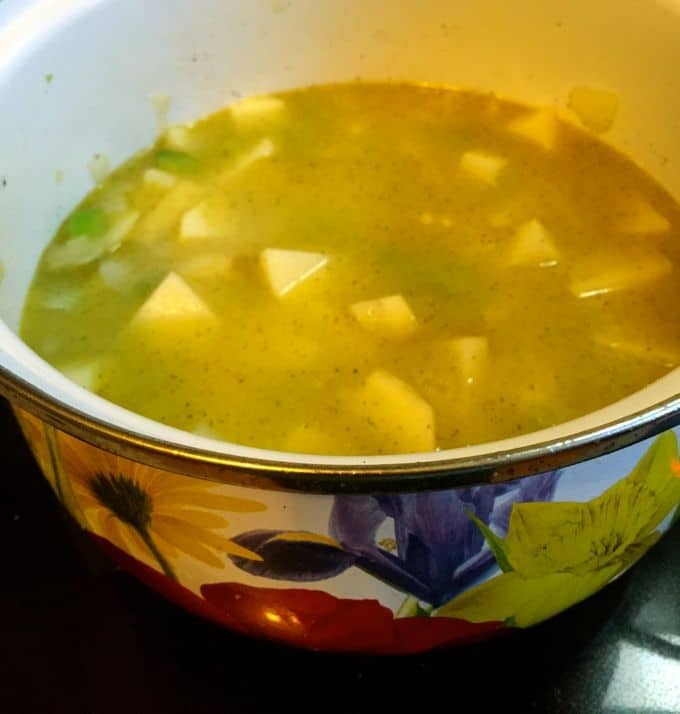 I’ve been making this potato soup for as long as I can remember and it has always been one of my “go-to” meals. It’s comfort food at its finest! My mother made potato soup often and would sometimes add sausage or other ingredients, but this simple recipe is my favorite way to prepare it. Now don’t get me wrong, I also love adding bacon, sour cream, cheese and chives to this basic recipe and making Twice Baked Potato Soup. But, today it’s all about this simple family favorite – Traditional Irish Potato Soup. Traditional Irish Potato Soup is a hearty and “stick to the ribs” kind of soup. Speaking of ribs; have you tried my delicious and easy Oven-Baked Baby Back Ribs recipe yet? It’s definitely a “must try” and quickly will become one of your favorite recipes too! Looking for more Irish inspired food for St. Patrick’s Day, check out my Ten Irish Recipes for St. Patrick’s Day Roundup, or 18 Incredible Dishes for St. Patrick’s Day from the Pudge Factor Blog. The ingredients are potatoes, butter, onion, celery, chicken stock, milk, Half and Half (which is optional), garlic powder, kosher salt, ground black pepper and optional, chopped fresh parsley for garnish. 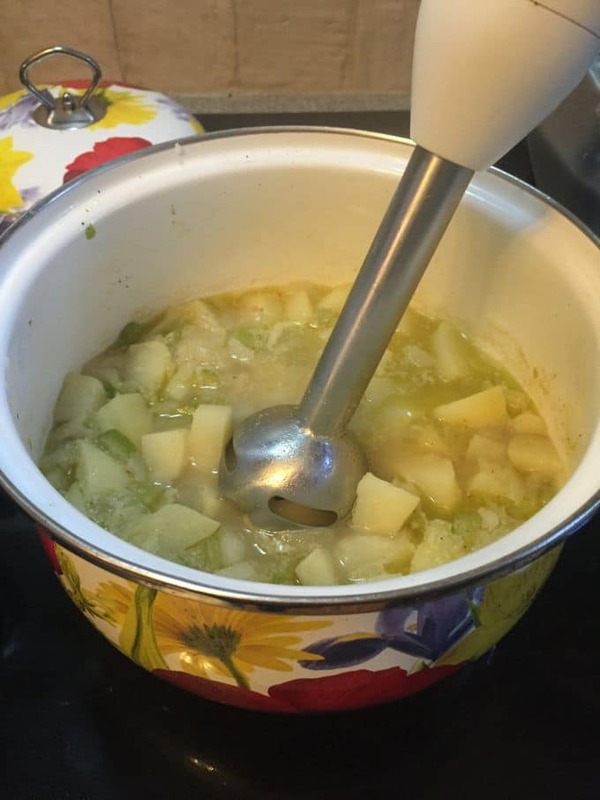 To make Traditional Irish Potato Soup, melt the butter in a Dutch oven or large pot over medium heat. Add the celery and onions and sauté for about 5-6 minutes until they are tender. Add the potatoes, garlic powder, kosher salt and pepper, and chicken stock. Bring the soup to a boil and reduce the heat to low. Simmer for 20-25 minutes or until the potatoes are completely done. They should break apart easily when you pierce them with a fork, and you should be able to easily mash them against the side of the pan. Use an immersion blender and blend until the potato mixture is smooth and creamy. When the mixture is smooth and creamy, add two cups of whole milk or 1-1/2 cup of milk and 1/2 cup of half-and-half. Taste and add additional salt and pepper if needed. An immersion blender is a small handheld kitchen appliance used to purée food in the container in which they are being prepared. They are relatively inexpensive and do a great job puréeing soups. If you do not have an immersion blender, you can use a food processor or blender, but you will have to do it in batches. Be extremely careful with the hot mixture. If all else fails, use a potato masher. You might have a few lumps, but the soup will still be delicious! If your chicken stock is reduced sodium you may need a little more salt; if it is regular chicken stock, you might not need any salt. 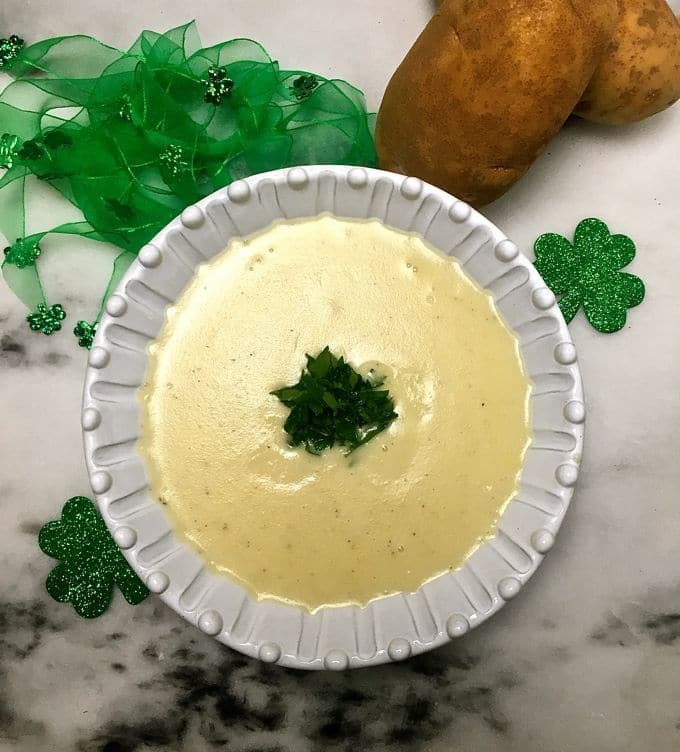 Traditional Irish Potato Soup is as simple to make as it is delicious and nutritious and this creamy soup is perfect for a St Patrick's Day meal or any meal. 2 cups whole milk or 1/1-2 cups whole milk and 1/2 cup half and half. Melt the butter in a Dutch oven or large pot over medium heat. 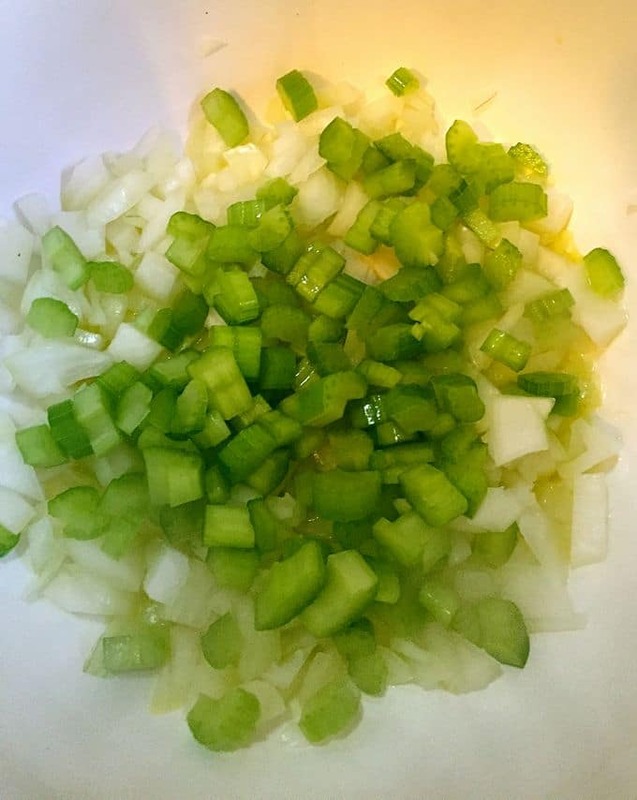 Add the celery and onions and sauté for about 5-6 minutes until they are tender. Add the potatoes, garlic powder, kosher salt and pepper, and chicken stock. Bring to a boil and reduce the heat to low. Simmer for 20-25 minutes or until the potatoes are completely done. They should break apart easily when you pierce them with a fork and you should be able to easily mash them against the side of the pan. When the mixture is smooth and creamy add the milk. Taste and add additional salt and pepper if needed. Serve immediately. My sweet friend brought me a batch of this tasty soup after I had jaw surgery. I ate it all by myself and it was fantastic. I highly recommend it if you want a savory, “stick to your ribs” kind of soup. It really hit the spot when I wasn’t feeling very well. Thank you so much for your kind words. I’m so glad you enjoyed the soup! Hi Tracy, sure if that’s the way like it. You might want to mash just a few so that it will have a creamy consistency. I hope you enjoy the soup, it’s one of our favorites. I love this recipe. It’s a year-round favorite. I made a couple of alternations to my own version that came out quite well. Rather than blending it down with a food processor, I cut a good portion of the potatoes smaller and then also cooked this for about 4 hours in the crockpot. The result was having the vegetables cook down into a potage more naturally. I mashed a few of the potatoes against the side of the crockpot with a wooden spoon at the end to get a thicker soup. But the cooking method did most of the work. The result is more of a rustic, thick soup. Also, at the end, rather than 2 cups of whole milk, I used one cup of half & half. The calories on the dairy were equivalent to the original recipe. 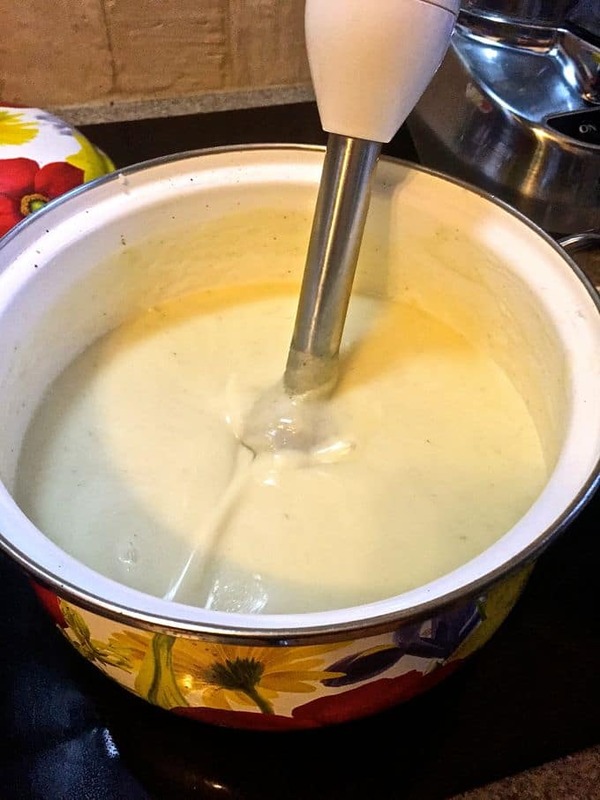 But the higher concentration of milk fat gave it more flavor. Thanks so much for sharing your changes and I am so glad you liked the soup. It’s a year-round of favorite of my family’s too! I’ve never cooked it in the crockpot, but that sounds like a great idea!